SystemProperties is a native extension to read system properties on Android and iOS. The extension provides an API to read properties, such as device MAC address, that are not available on the regular AIR API. The extension has the following properties on Android and iOS: version (current version of the operating system), OS name, language (language set in the system preferences), UID (unique ID based on some of the device properties), device name, MAC Address and model. As Android only properties, the developer can read the serial number of system, architecture of the cpu, package name, source directory, AppUid, phone numbe, IMSI and IMEI. 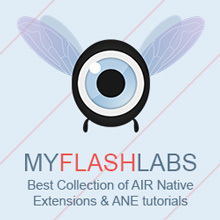 Air Native Extension, Android, iOS. URL. Keep up-to-date with the last published tools by e-mail. Don't worry, we won't send you spam. © 2019 As3GameGears - Boost your tools! Powered by WordPress with theme based on Salju, by WPCharity. All information on this website is provided "as is" with no guarantees (see disclaimer page).